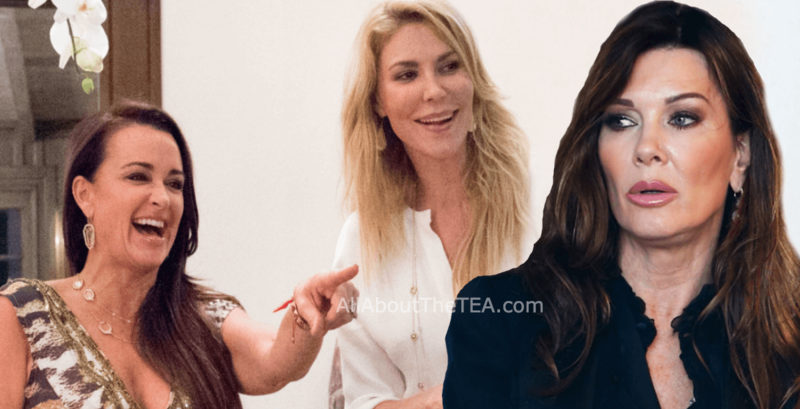 Kyle Richards and Brandi Glanville have rekindled their friendship, the Real Housewives of Beverly Hills frenemies reconnecting in the wake of the Season 9 blowout between Kyle, 50, and Lisa Vanderpump. RELATED: Dorit Kemsley Exposed For Delivering ‘Vanderpump Dog’ To Kill Shelter & Lying About PK’s Dog Bite! A source dished to Hollywood Life about the reality star remix, which began even before Kyle and Lisa’s aired smackdown. “Brandi actually reached out to Kyle and they recently started following one another on social media again,” the source said. RELATED: Teddi Mellencamp Started #PuppyGate After Brother Shot Down for Role On Vanderpump Rules! Fans watched Kyle Richards and Lisa’s friendship implode on camera, after Kyle accused Lisa of planting a tabloid story exposing Dorit Kemsley’s ill-fated dog adoption. The insider claimed that both Kyle and Brandi have had a “change of heart,” and have Lisa to thank for bringing them back together. MUST READ: Lucy Lucy Apple Juice Suffered Extreme Trauma In the Care of Dorit Kemsley — Dog’s New Owner Speaks Out Amid PuppyGate Scandal! Brandi tweeted her support for Kyle after the fiery episode aired. The insider revealed that Brandi and Kyle had already chatted about the upcoming season — reconnecting via their common link — a shattered relationship with Lisa. “They’ve spoken a few times about Lisa and this season of RHOBH and they now laugh at the fact they haven’t spoken for all of these years, so they thank Lisa for bringing them back together,” explained the source. The snitch delivered a non-shocker — that Brandi would love to make a RHOBH comeback — despite Lisa’s staunch refusal to participate. “Brandi would totally come back if she was asked, but Lisa has said several times she will not film with Brandi,” the insider said. Lisa Vanderpump, 58, confirmed her feelings about renewing a relationship with the booted Bravoleb during a January appearance on Watch What Happens Live — reiterating that she would never rekindle a friendship with Brandi. Will Kyle Richards reconciliation with Brandi prove to be a game-changer? Stay tuned — and watch The Real Housewives of Beverly Hills, Tuesday nights, at 9 pm, ET, on Bravo.